Expand "Articles" section in the left navigation bar and click on "Add new" link to open "Add Article" page. Select the "Type" of the category. With Public type, an article will be published under public categories and will be accessible by all end users. With Private type, the article will be visible to logged in users only. In multi-language edition, the language name in which the article is being created is mentioned with panel heading. As shown in the screenshot below, an article is being added to English language, so, English is written with panel heading ’Category Selection’. You can change the language from language drop-down available on the right side, whereas, in non ML editions, language menu is not available. "Choose Categories" as per the requirement of the article. The article can be assigned to multiple categories, by selecting them from categories drop-down. "Title" can be a question, a caption or a headline of your article. It is not allowed to add multiple articles with the same title under one category. "Content" inscribes the body of the article. PHPKB provides a powerful WYSIWYG editor with various features for formatting your content just like MS-Word. "Keywords" are the important words that classify your article and are relevant for searching through the database. "Summary" is a compact view of your article for meta description attribute. Search engines may present this summary (if they think it’s relevant to the search query) on the results page below the page title. "Article Options" provide various options for authors to control visibility, comments, ratings, publishing and expiry date of the article. Make it Featured: Mark this as a featured article if you want the article to appear in the “Featured Articles” section of your knowledge base. Make it Visible: Uncheck this if you do not want the article to be visible to end users (front end users). Enable Comments: Uncheck this if you do not want to allow users to post comments on this article. Enable Ratings: Uncheck this if you want to turn off the ratings for this article. Set Publish Date: Publish date is a date on which the article is planned to be published. Check this checkbox to set a publish date from the date calendar. Set Expiry Date: Check this to set the time limit up to when the article will be accessible by front end users. You can set the expiry date in between 365 days from current date. A user can "Attach Files" and documents related to the article. "Custom Fields" display the custom fields you have created for your knowledge base articles. Refer article Adding a Custom Field for more details. Click "Preview Article" button to preview the article (even unsaved) with the latest changes as it will be published to the front-end users. Authors are advised to preview article once before publishing. Click "Save as Draft" button to save changes as your personal draft. You can continue to edit this draft later on and can save it as an article or delete it. 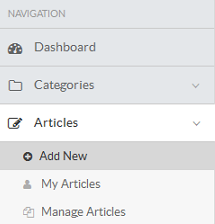 Click "Save Article" button to store your changes and publish the article in the knowledge base. Click "Cancel" button to return to ’Manage articles’ screen without saving the changes you have made in the article.